Looking for a break from your turkey sandwiches? 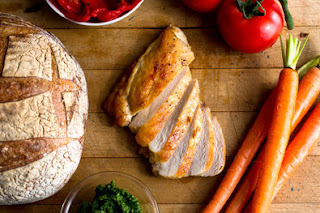 How about roasted chicken, arugula (or spinach), roasted red pepper with a smear of pesto? If you buy rotisserie chicken, save some for this sandwich. Or poach boneless breasts in a shallow amount of seasoned chicken stock/broth until the meat is just done. Use jarred pesto, or make your own. It's easy, and of course delicious, and serves just as well for a light, protein-rich supper. Toast the bread lightly, if desired. Spread each side with some of the pesto. Add a layer of chicken slices, the grated carrots, greens and finally, the red pepper slices. Put top piece of bread on the sandwich, cut in half, and serve! Cocktails at Bakersfield -- make 'em at home! The way-fun tacos joint on Vine Street called Bakersfield continues to be one of my favorite places in town for a satisfying, inexpensive and healthy-enough dinner. Although it's crowded and noisy no matter what time or day you go, I love it anyway. In addition to the yummy food, the cocktails are first rate. 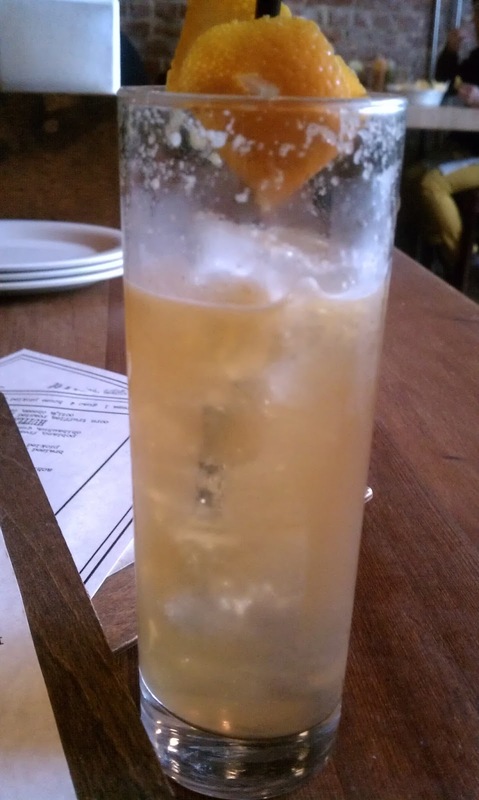 Here's a photo of the one I had the other night -- I think it was called Chase Avenue -- with a few sips already imbibed before I remembered to take a photo. They're generous about sharing recipes for their bourbon and tequila based concoctions (and others that feature vodka or rum, as well). Here are a couple of their best-sellers, starting with my all time Bakersfield favorite, the spicy Red Headed Stranger. Add cayenne, lemon juice and bitters to a shaker; stir to dissolve cayenne. Add bourbon and liqueur. Shake over ice. Strain into an ice-filled rocks glass and garnish with candied ginger. Note: The ginger adds a spicy kick of its own, so start with a little cayenne unless you like to have your lips burned. It took me a couple of tries to get this drink right at home. 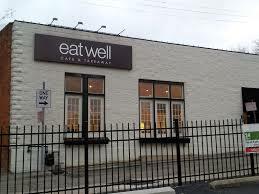 Made my second visit to Eat Well Cafe, in O'Bryonville, this week, and had a better chance to sample and appreciate what this bright, pleasant (mostly) lunch spot has to offer. I'd gone once before on a very cold winter day with a friend who doesn't really enjoy eating, which usually holds me back from full enjoyment of my own. This time I went with my ravenous husband, which gave me permission to have more than a cup of soup with a couple of crackers, as on my first visit. He selected from one of the pasta bowls -- his choice was pearl couscous (the Israeli variety) with roasted veggies, chicken and pesto. The portion was large but, in character, he ate all of it and said "yum" quite a few times as he did so. I went with one of the salads, also served in a large bowl, the same size as his pasta dish. The choices were called Health, East and West. Each had an interesting combo of ingredients that made it hard to select, but I ended up with the East Salad, in part because it was the only one without cheese, which I wasn't in the mood for. 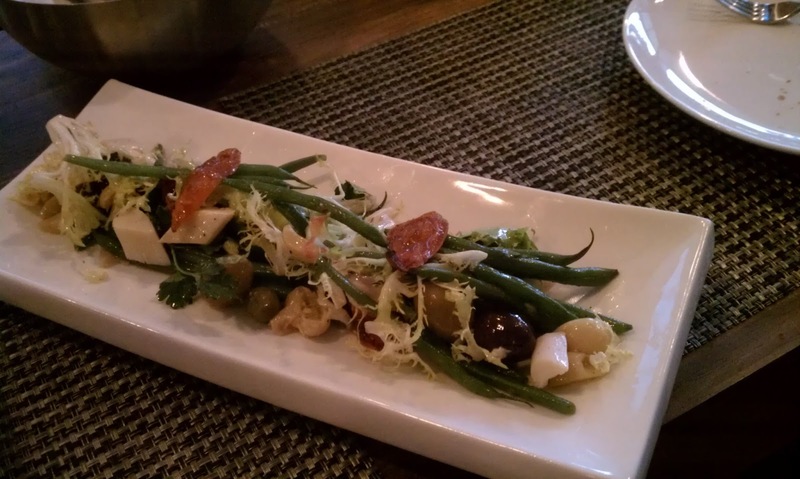 The salad was impressive in its combination of flavors and textures, as well as the evident care that went into preparing the ingredients. I was especially impressed by the high quality of the pulled chicken, which was lean (all the skin and fat had been removed) even though it included bits of dark meat, and clearly not some kind of industrial meat. The other notable ingredient was what they called orange supremes, which was slices of fresh oranges with the white membrane removed -- something that you almost never see anywhere. I know the amount of labor it takes to slice an orange that way, and appreciated every bite. Rounding out the salad were sliced almonds and a nice sprinkling of fried wontons. Along with the salad, I had a large mug of chamomile tea, which hit the spot on another cold, wintery day (even though it's the end of March). While I don't think the cafe itself has a website, the venture that includes catering can be found online here. 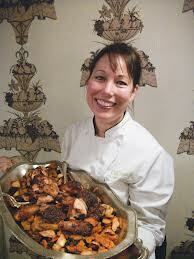 Chef/owner Renee Schuler was chef at our favorite rural getaway, Murphin Ridge Inn. We both really liked our meal here and definitely plan many return visits. Healthy and delicious, too! It's at 3009 O'Bryon Street and is open Monday - Friday 11-8:30 and Saturday 9 - 4. Zula Restaurant and Wine Bar is the latest addition to the restaurant and bar scene in the part of downtown Cincinnati known either as the Gateway Quarter or, more broadly, by its traditional moniker "Over-the-Rhine" (OTR for short). Having opened toward the end of February, Zula has been discovered by hordes of young urbanistas who have made it hard to find a table at the area's other watering holes and foodie destinations (A Tavola, Abigail Street, Senate, Bakersfield, to name a few). 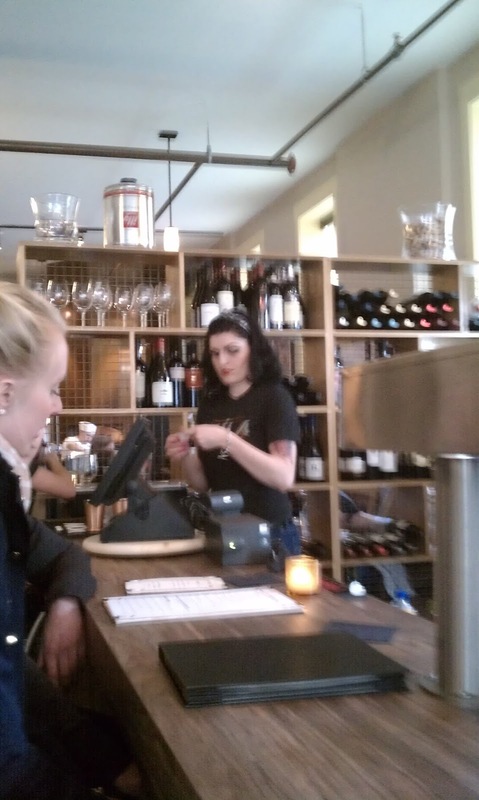 Unlike most of their neighbors, however, at least Zula does take reservations. We arrived early-ish on Saturday night without reservations but were lucky enough to find a couple of seats at the bar, where we started with cocktails and moved on to sample menu items from Chef Tsvika Silberberg, who goes by "Vic." He has spent the past 12 years cooking at the Celestial in Mt. Adams before getting this chance to open his own place. Menu specialties include an array of interesting preparations of mussels; we tried a simple tomato-and-garlic sauce and appreciated the plump, fresh shellfish in a tasty broth. Otherwise, we split a nice salad that included hearts of palm and haricots verts, then each had a "hot plate" -- lamb moussaka for me (a surprisingly light version of what often is a heavy dish) and sliced, cured salmon for him (which he "yum-yum"-ed through every bite). We also split a pleasantly light dessert, an olive-oil based pound cake topped with citrus salad, no cream or ice cream to weigh it down. For those who crave something heartier, though, there were richer desserts. 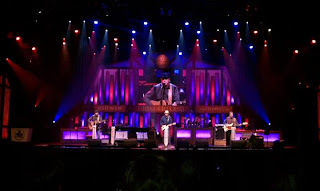 All in all, we had a great time and were impressed with just about everything -- the drinks, scene, food, etc. This week was spring break where I teach (University of Cincinnati), so my husband and I drove down to Nashville TN to catch some live music and see what that up-and-coming city is all about. He had been there briefly many years ago, but otherwise we had never really done the town. 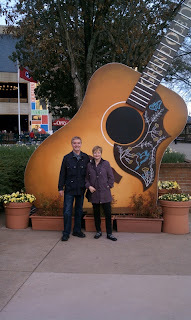 We saw a terrific show at the Grand Ole Opry -- photo of us in front of the place (and the big guitar) is here-- as well as an intimate, acoustic set at the red-hot and hard to get into Bluebird Cafe. Other highlights included a tour of RCA's Studio B, where Elvis recorded the majority of his music, along with many other influential musicians of the 1950s and 1960s. The food scene, however, was disappointing. Admittedly, I didn't do much advance research and made no reservations, so we were at the mercy of our location -- downtown, walking distance to the honky-tonks and so forth -- and the advice of random people. We got sent to barbecue joints, Southern cooking meccas, and the like. Everything was very heavy, and for the most part not all that good. 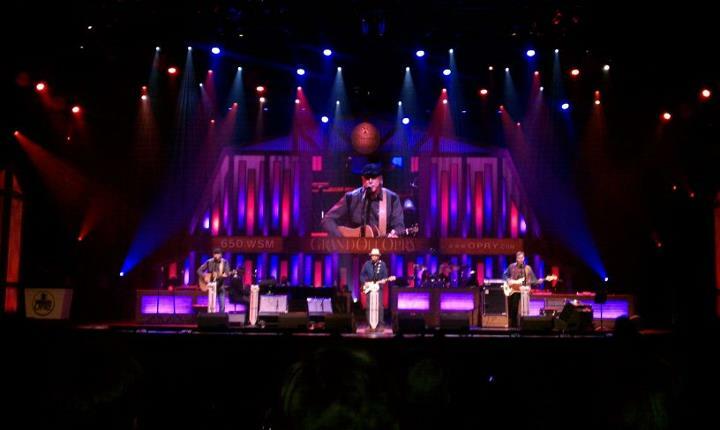 We would return to Nashville though, and the Opry, to hear the amazingly high quality of musicianship on display at the major venues. And next time, I'll try to plan better in terms of where to eat. 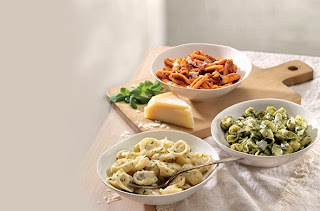 New at Panera Bread: in addition to the long-time, tried and true lineup of sandwiches, soups and salads, the chain just added three new, seasonal pasta dishes. Here's an excerpt from their announcement, along with a recipe for one of the dishes. I can't vouch for the health profile of these pastas, but if you stick with the 8-ounce serving, you won't go overboard. The recipe below is richer than anything I would make or eat. I've added a few notes in the ingredients list where you could cut some of the fat and calories. "Each new pasta entrée is offered in an 8- or 16-ounce serving and includes the choice of a half cafe salad or cup of soup. All are served with freshly baked bread. "Flavors include: Rustic Penne Belognese, Tortellni Alfredo, Pesto Sacchettini and a kids' entrée of Buttered Ribbon Noodles. Long, flat noodles with ruffled edges are tossed in a simple yet flavorful sauce of creamy butter and sea salt." 2. Bring a large pot of salted water to a boil. Add pasta and cook until just tender, 7 to 10 minutes. Drain, reserving about 1/2 cup of the cooking water. 3. Meanwhile, toast walnuts in a large deep skillet over medium heat until fragrant, about 5 minutes, shaking pan often to prevent burning. Remove and set aside. 4. Heat oil in same skillet over medium heat. Add bread crumbs and cook until toasted and golden brown, about 5 minutes. Add garlic and cook 1 minute. Add butter or olive oil, capers, walnuts and pasta, tossing to coat, and add enough reserved cooking water so the walnuts cling to the pasta (a couple of tablespoons should do it). Season with salt and pepper. Gluten-free Chocolate Cookies, very chocolaty! With the disturbing increase in food allergies these days, more people are asking for gluten-free recipes. My friend came up with this one for chocolate cookies. Anything with chocolate works for me! Preheat oven to 350 degrees. Lightly coat 2 baking sheets with cooking spray. Melt one cup of the chocolate chips for about 2 minutes in a microwave, stopping to stir twice. Be careful not to overcook or burn the chocolate. Cool slightly. Meanwhile, whip egg whites in a large bowl to soft peaks. Gradually beat in ½ cup powdered sugar. Continue to beat until mixture resembles soft marshmallow cream. Whisk cocoa and cornstarch in a medium bowl to blend. On low speed, mix dry ingredients into egg white mixture. Add melted chocolate, maple syrup and remaining chocolate chips. Form dough into 1-inch rounded balls, and roll in remaining powdered sugar. Arrange on prepared baking sheets, spacing about 2 inches apart. Bake until puffed and tops cracked, about 10 minutes. After removing from oven, place baking sheets on racks to cool for about 10 minutes. Carefully remove from sheets and cool completely on racks. Let's get a jump on spring by cooking with early-spring ingredients. I'm thinking about peas! Here's a recipe I like to whip out in March, when I can find fresh peas in grocery stores and the early farmers' markets. Not only does it remind me of green things and flowers--the bonus is, this dish cooks in no time. 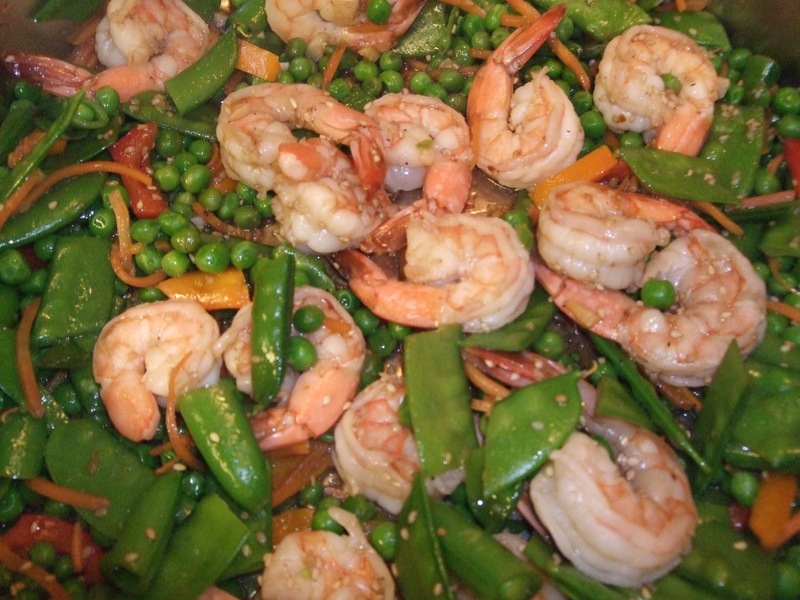 The only hassle (IMHO) is peeling the shrimp. Otherwise, it's a breeze! Think of this as southern France's answer to minestrone, a seasonal vegetable soup — enriched with a simplified basil pesto (no pine nuts) — that is more common in warmer weather, when fresh basil grows plentifully. But you can make it off-season, too. 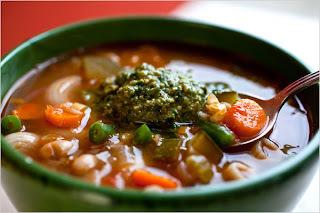 Some of the ingredients are likely to be in your pantry right now (white beans, canned tomatoes and soup pasta). Don't be intimidated by the long list of ingredients--it's not as hard as it looks. Note also that you can buy pre-chopped carrots, celery and onions at most supermarkets. You also can omit some of the veggies -- I'd skip the turnips -- to cut down on the prep time, and substitute jarred pesto for the homemade. And it's OK to prepare through step 2 a day ahead. 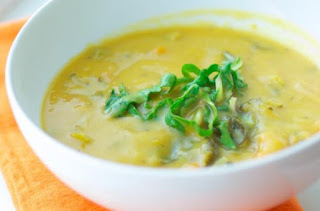 This is a yummy soup that reminds me of Nice and the beautiful, blue Mediterranean! Adapted from a favorite source, "Recipes for Health" in the NY Times. 1. Heat the olive oil in a heavy skillet, and add chopped onion and a generous pinch of salt. Cook, stirring, until tender, about five minutes. Add the leeks and garlic. Stir together for a few minutes, and add the tomatoes. Cook, stirring, until the tomatoes have cooked down slightly and the mixture is fragrant, five to 10 minutes. Stir this mixture into a large soup pot, add the beans and all of the remaining vegetables except the green beans, and bring back to a simmer. Cover and simmer over low heat for 45 minutes to an hour. Taste and adjust the seasonings. 2. While the soup is simmering, blanch the green beans for five minutes in salted boiling water. Transfer to a bowl of ice-cold water. Drain and set aside. 3. To make the pesto, mash the garlic with a generous pinch of salt in a mortar and pestle. Remove it and set aside. Grind the basil to a paste in the mortar, a handful at a time, then add the garlic back in and mix together well. Work in the olive oil a tablespoon at a time, then stir in the cheese. 4. Add the pasta to the simmering soup about 10 minutes before serving, and cook until al dente. Add pepper, taste and adjust salt. Stir the blanched green beans into the soup and heat through. Serve, adding a spoonful of pesto to each bowl for guests to stir in. Pass additional Parmesan for sprinkling. I've posted about Seasons 52 before, so this will be brief. My husband joined me for dinner there -- newly opened in Rookwood Plaza, Hyde Park -- over the weekend. In the photo is my filet mignon dinner with mashed potatoes (475 calories for the plate, the restaurant claims) and his broiled trout with roasted potatoes and carrots (about 400 calories). On a previous visit, our waitress said that if a customer asks for butter, he/she is out of luck. There is none in the house. Plus she said the kitchen doesn't have a deep fryer. 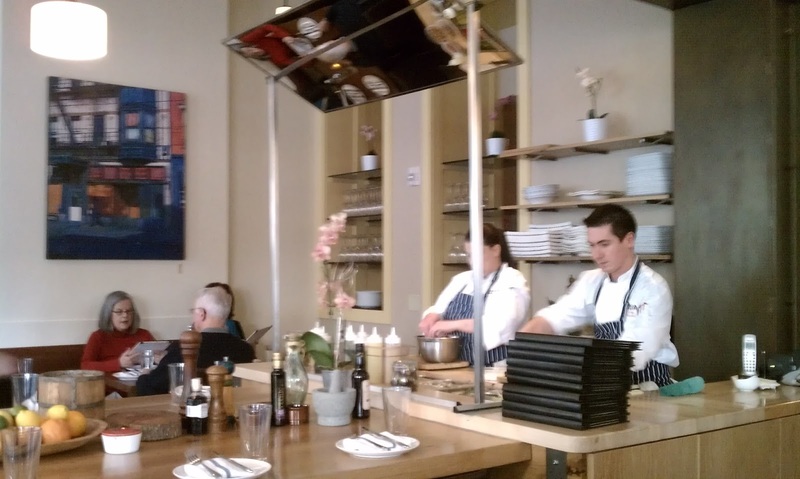 I think these are great developments and urge everyone to patronize this restaurant. If you don't live in the Cincinnati area, fear not, because it's a chain with locations in several states. I first became acquainted with it in Atlanta, and then Chicago, before one opened here. 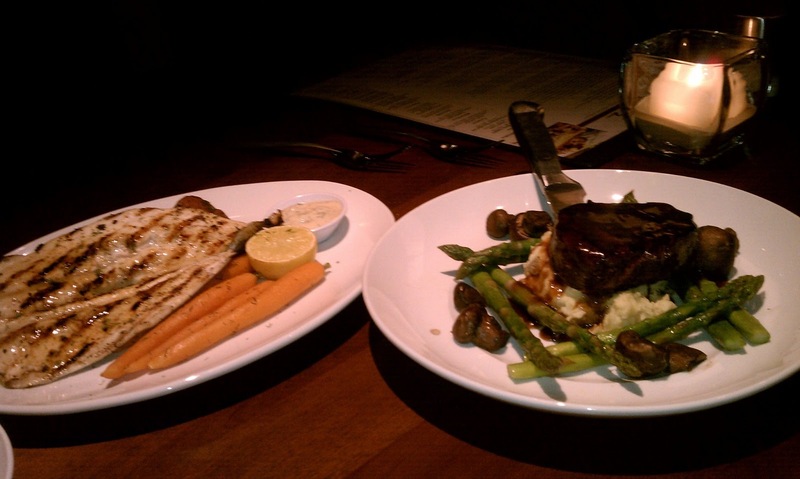 To find out if there's a location near you, check out their website: www.seasons52.com. You'll love this soup that substitutes cauliflower puree for cream. Steam cauliflower florets until just tender. Place cauliflower in a blender with 1/4 cup of water, 1 tablespoon of butter and blend until well combined. Season generously with sea salt and pepper. Blend again. Set aside. Heat 1 tablespoon of butter in a deep pot over medium high heat. Add carrots, celery, and onion, cover and cook 5 minutes, stirring occasionally until vegetables are soft. Add salt, pepper, thyme, sweet potatoes and broth to the pot. Cover and bring to a boil. 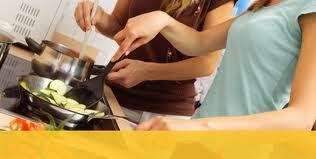 Reduce heat back to medium and cook 25 to 30 minutes longer or until potatoes are tender. When potatoes are fork tender, add broccoli, cauliflower purée and remaining chard and cook for another 10 to 15 minutes stirring occasionally. Serve with bread and cheese, or on its own.